When you need assistance finding the perfect floor for your home or business, visit our locally operated showroom. We maintain unparalleled recognition by offering high-quality flooring, affordable prices and professional experience you can depend on. Furthermore, we are dedicated to providing expert vinyl flooring installation for all products. We strive to make your renovation a pleasant experience every step of the way. Let the specialists at our showroom guide you through the many choices that suit your design needs and budget. With our help and massive inventory, you are sure to pick a flooring style you will love for many years to come. Vinyl floors are a top flooring option not only because of their affordability, but also their durability. A vinyl product stands up well to high impact incidents and heavy foot traffic, making it perfect for busy families and bustling businesses. Vinyl floors also offer a comfortable surface to work and play on and it doesn’t get too chilled in the winter. With high moisture resistance, vinyl is ideal for kitchens, bathrooms, laundry rooms, and entrance ways. Types of vinyl include no-wax, urethane, and enhanced urethane. Each type provides diverse qualities. For example, enhanced urethane is the most resistant to scratches, grime and cleaning solvents. Learn more about the durability of vinyl and the different types available by speaking with one of our staff members at our store or over the phone. Renovate without straining your wallet by choosing vinyl sheet flooring. This flooring style is highly versatile, allowing you to achieve almost any kind of look. It is manufactured using state-of-the-art print technology to create realistic designs that imitate any kind of material. No matter what kind of design you prefer, there’s a vinyl sheet product for you at our store. 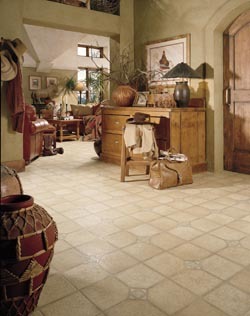 Homeowners and business owners across the nation love the classic appeal of tile flooring. However, tile is not an ideal fit for everyone’s budget. Fortunately, you can mimic the elegant and stylish appearance of tile at a fraction of the price by installing vinyl tile flooring. With numerous sizes, patterns, and hues available, our showroom is sure to have a vinyl tile option that complements your décor. Add warmth to your property with vinyl plank flooring. Vinyl plank products replicate the appearance of natural hardwood floors at a much lower price. Regardless of what wood species or finish you admire, there is a vinyl option for you that realistically imitates the look. Stop by our showroom to browse our wide range of products and find the perfect one for your home or business. From design consultations to professional installation, our store helps you transform your property every step of the way. When you visit us for advice, we listen carefully to what you are looking for and offer suggestions. We recommend superior vinyl plank flooring options based on the qualities that matter most to you, such as pricing, dirt and scratch resistance, easy maintenance and design style. Once you have chosen your new floor, our vinyl flooring installation team goes to work. Our installers are certified to work with all the products we sell, ensuring that your floor is put in perfectly. We even offer expert floor-care advice so you can maintain your floor and prolong its life. Let our specialists help you get your renovation project started today. Contact us for more information on the many varieties of vinyl flooring available in our showroom. We proudly serve the communities of Vernon, South Windsor, Ellington, Tolland, and Manchester, Connecticut, as well as the surrounding areas.